Habitat: Open and semi-open habitat including farmland, forest openings, marshes, and residential areas. Prefers habitat which has trees with existing nesting cavities. Requires high perches from which to hunt. Diet: Insects, including grasshoppers, dragonflies, beetles, and caterpillars; small mammals such as voles and mice; small birds, frogs, lizards, small snakes. 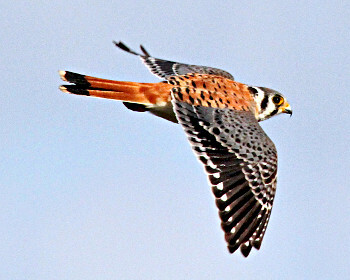 The American Kestrel is the smallest North American falcon, being only 9-12 inches in length. This raptor is found in open or semi-open habitats, preferring areas which have trees with natural cavities for nesting. 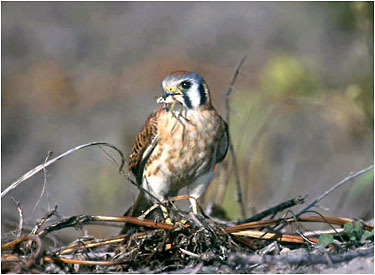 It is believed that American Kestrels mate for life. However, due to the stricter than usual division of labor, the male and female spend very little time together, even during breeding season. During this period, the male spends most of his time hunting for food for himself and his mate. The female spends most of her time either on or near the nest, although the male does relieve the female from incubation for part of each day. Kestrels in southern areas are often permanent residents. However, the more northern birds generally migrate further south for the winter. The peak migration period is mid-September through early October. Dark flight feathers with pale subterminal spots creating a "string of pearls"